"I am the light that illuminates all things. I am all things. Split a piece of wood and you will find me. Pick up a rock and you will find me..."
-- Jesus Christ, from the "lost" writings of Thomas. I am onto a method of identifying any point in space and finding it again. Some moire images have the phenomena. These images are fixed in relation to other movements. So why isn't this information in common use? In addition, the UFO dudes/critters should be hep to the fact that rock images are recording from space automatically. They do in all tangibles. Shaver's take on that: outside of rock images (some do look like a form of book) was what he called "universal imagery" and whoever made all of the rocks had a way of keeping it out of them. If they did not, the result would be a confused montage. When I discovered images in common wood it proved that they are fixed in space. As the tree grows, the images register in the wood. Also, they have image planes that are very accurately aligned (usually at 90 degrees). Four years ago I invented a shock-wave method of printing them directly from space. All of which tosses Einstein's notion of relativity into the dumpster. Space is an object. (Tesla said that). The aether concept was discarded a long time ago because tangible features were attributed to it. And what about the invisible images??? I find images that reproduce only in infra-red in wood. Like copiers see some in infra-red. Invisible images in space that somehow become visible might explain a few aspects of UFO sightings. Gas currents can register them, such as flame images. Or the many images seen by mariners that are often noted in log books. Most often there is a hazy condition. I found that thin snow falling with a heavy overcast can register the images in space. Shaver recognized image sources other than rocks. He said they had inferior (and they do sometimes) images similar to the real thing. He thought that they might contaminate rock books. Also an easy logic, the makers of the books in rock had a practical way of blocking or eliminating or erasing them, or else the result would be a montage mess. At first I called non-rock images universal images for lack of a better term. Then, (and Shaver never responded to this) I got some very high quality images from common modern glass. Not long after, I got a very high quality cloud image on film by overexposure. Cloud images are of very low contrast. Again, no feedback from Shaver. I got some good images from flat (or nearly so) glass with accretions -- thin films of accumilated crud from glass found in the local beer joint parking lot -- again no comment from Shaver. Shaver was guilty of a sin of the orthadox science he often complained about: Exclusionism. True, compared to rock and other sources such as glass, wood pix are limited. Due to grain, they seldom enlarge over three diameters. Of course for the arty images, predominent grain can add desired texture. Unlike more solid sources, the wood grain compresses with rubbing. 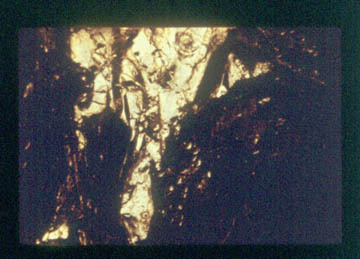 Each rubbing on an area produces partially or completely different images. However, even dirty wood can have good images. Some of those are improved by using a high quality copier to reproduce. I have had some very good results with common oak. Compared with some optically done rock pictures, they are easy and cheap to obtain. Source: more grows every day. 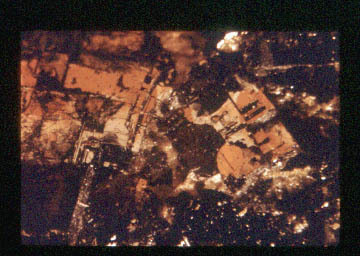 Many images on stained or dirty wood can be seen clearly with the long view at approximately 10 to 20 feet. I tuned in a bit late on the rock pic scene. Got Shaver's free brochure in the mail from the full page ad in SEARCH Magazine. It took me a short jiffy to verify that he was onto something. With almost no database to go on, he got the image characteristics correct. Shaver should have gotten the Nobel prize for his research and what it revealed about how the human brain handles images; and for his theories on the technology of the images. But the logistics of Shaver's notion that all rocks were manufactured fails when the logistics are scrutinized. It involves the fantastic assumption that this planet is somebody's old library. What would be the mechanics of converting the substance of a planet into image recordings? One of the biggest gravel deposits... millions of tons of it, is a half mile north of here (Chillicothe, Illinois). It is up to two miles wide and seven and one half miles long and from 40 to 180 feet deep. Like how long would it take to convert all that into rock books? Yes, there has been an exceedingly long time for a lot to happen in this big universe. But off-hand, it is [a fantastic notion]. What practical use would that many [rock books] be? As I have proven (and so did Shaver) some rocks have a colassal number of images, if only we could extract them with the proper apparatus. His attempts to connect rock images with any history were totally unreal. Another thing he never responded to. Have you read an old book ( reprinted a few times in paperback ) "Times of Fire And Raganokk" by Ignatious Donnelly? It has theories that are not acceptable to orthodox science. It's about cosmic events and the origins of minerals (including coal and oil) and states that this hemisphere has colossally big deposits of till, gravel and boulders. Those are a mystery, like the ones here in Illinois. There's no granite in this part of the state, but there are thousands (and more no doubt) of pieces of granite and other stones and boulders. What broke them out and wore them down, and how did they get so far away from any granite deposit? His notion: they are space junk. 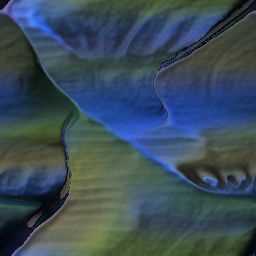 If so, that means I have a lot of extraterrestrial pix... images in rock from way out there when rock was being formed. A real super-deluxe time capsule. And lots of that is from who-knows-how far out and how far back in space/time? Rock pix and all the other aspects of the Shaver Mystery are great for psychological research. I have always been interested in abnormal psychology, and have read a lot of the literature, even Klekly's THE MASK OF SANITY. Can [rock books] replace the very inadequate ink blots? Many rock images do have an organization that is booklike. One of Shaver's [rocks] strongly resembled a scrapbook. Eight years ago, I was doing some surreal art. Some of it was elaborate doodles, (mistaken for art?). I was using carbon paper and thin paper on wood for the grain texture. I used various stylii for the drawing. I noticed small images in the lines and shaded areas. In wood? I did some rubbings. My results were varied. It was the same sort of images I had found elsewhere. I also found that the history of the wood made a big difference. One of the best peices of wood [I experimented with] was from a decrepit shipping pallet made of red oak. Worn wood usually has betterimages. Up front, nearly everybody is always doing a lot of ignoring of these images. But that is the common hardwiring in the human brain. It's good for eliminating a lot of distraction for one thing. The few who do not [have the hardwiring] are often classed as delusional. The shrink section of the Encyclopedia Britannica has the opinion that "Those who see images in objects" are off kilter. With the human herd, a few photos are rare exceptions. A snow pic and several cloud pix are purported to be Christ and have had a large popularity, however, as well as a few other presumed images of religious figures. It is a gap image -- images formed in part by outlines. Those show up in cloud pix also. I noticed, as I ate lunch today, that a fold in my jacket laying on the recliner looked like an ET grey, but re-focusing front and center, it was only an incomplete approximation. The human mind has a habit of assuming parts of what is seen. Very practical up to a point. Works best in simple environments. Most of common seeing is just spot checking, which is hooked onto the brain emergency circuits. Shaver spoke of viewing rock pix with 'slow vision.' There are two kinds of slow vision: 1. Scanner turned off and intent stare. 2. Then there is the super high-performance slow vision that works best on the edge or into night vision. I got onto that one from an old occult crowd bit. If you stare at your reflection in a black mirror in dim light you will (?) see what you looked like in past lives. I tried that on some early rock pix and it did work. Suddenly, like a mind relay clicked in, I saw a lot more and completely different scenes. Also it worked well on printed rock pix, like of mountain territory. Rock pix are all sizes. Nope I didn't check up with the black mirror. One of the many oddities about these images is the common failure to recognize that they are a complete mystery. They just cannot happen, (by common logic). Everything is mechanism. There has to be [something] to make them. The images themselves are a very complex mechanism. Also, several features of them operate because the human brain has the (original equipment) to utilize them. The image's content is completely anachronistic. Some common contemporary images of humans are in the rubbings enclosed (see the images section of this article). They are from wood not over 80 years old. Some is plywood. They are the images recorded when that tree grew. Obviously, there is a mechanism for it that is so far otherwise intangible to us, but electromagnetic waves are intangible until they impinge. The vast number of these images is beyond our enumeration. It is easy to determine that a single one inch cubical crystal of common galena has over a million images. More correctly image sets. Single images in this image category are very rare. They evidently occupy all space in the universe, and appear in tangibles everywhere. And on all scales of size. The extent of the spectrum they respond to has yet to be fully determined. A very simple apparatus gets vast numbers of usable images from wood. In this instance, just some carbon paper tissues for manifolding, second+ copies, (or carbon paper and any thin, strong paper) and a stylus. I have a Stanley metal handle putty knife. The handle works very well for a large number of surfaces. Other surfaces require different styli. I have gotten good tracings/rubbings with my thumbnail. Some patience and practice is needed to get good rubbings. Different directions of linear rubbings yield different images. Impression pressure can be critical. The wood grain obscures fine detail often, so enlargements beyond two are seldom practical.